In the aftermath of the Case Keenum controversy, history seems to be repeating itself. The NFL and its ATC spotters cannot continue to turn a blind eye. Last week, Ben Roethlisberger took a hit to his head. Play was stopped to assess an unnecessary roughness penalty but the game was not halted to check for any head injury that may have resulted from the blow. Big Ben played eight more plays before removing himself from the game and later was found to have a concussion. 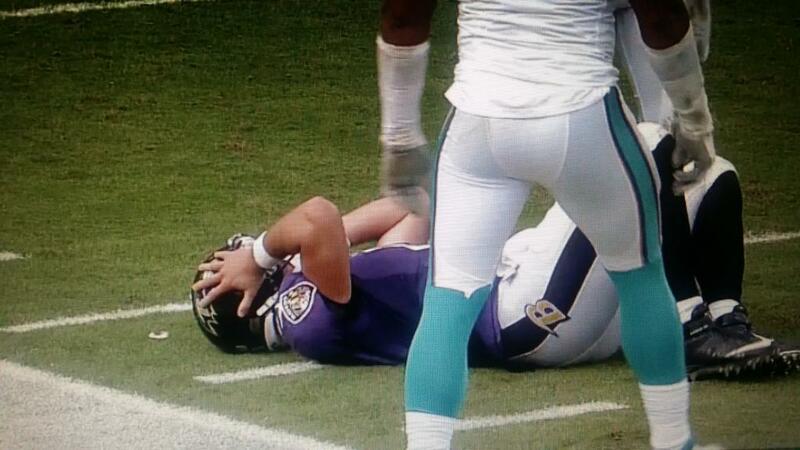 This week, Matt Schaub hit the back of his head on the turf and clutched his head with both hands. You judge whether a medical timeout should be taken. Although a referee comes over to check briefly on Schaub, the spotter did not call down, the play clock did not stop and Schaub proceeded to take the next snap. To me the Keenum and Schaub videos should be used educationally as points of emphasis to get the spotters to call a medical timeout in these situations. The NFL does it for referees on rules, why not educate and encourage the “eye-in-the-sky” to stop play for an evaluation. Referees should also be instructed to have medical staff evaluate instead of checking themselves when they see a player’s head bounce off the turf. The publicized health and safety conference call last week did not involve medical personnel, but perhaps there should be one for the spotters. Although Schaub was determined to not have a concussion, in the six plays after he clutched his head, the Ravens QB threw two interceptions including a pick-six. Coach John Harbaugh said Schaub was checked “right away”. By TV and eyewitness report, the evaluation by the team trainer probably occurred during a team timeout one play later. Cam Newton also took a shot to the head yet was allowed to finish the series without a medical timeout being called. During a trip to the locker room for a bathroom break, Newton was quickly cleared by an independent neurologist. What good is it to have the medical timeout if it is not used? The NFL expected the new rule to be used sparingly, indicating 10 times in a season would be a lot. I don’t have an official count of the number of times the new rule has been used but it can be counted on one hand. If the medical timeout is not used to help the most protected and scrutinized position of quarterback, what chance do linemen have of ever benefiting from the new rule? Contrary to public opinion that teams should be fined for “missing” concussions, the spotter is not in any way affiliated currently or in the past with any NFL team. In my experience, the league has done a good job in selecting qualified ATC spotters. The “eye-in-the-sky” is chosen as a seasoned medical professional who has worked football extensively. No question the spotter job is not easy but identifying hits that might cause concussion is their one and only assigned task. Although it is a good sign that players are removing themselves, the system should not leave it up to the athletes. LeSean McCoy and William Gay self-reported symptoms. McCoy was found not to have a concussion and returned to action for the Bills. The NFL has said it will investigate the Schaub incident as it does all health and safety issues. It is routine for medical personnel to get calls from New York if there is any controversy. The concussion policy is far from perfect and we can never detect every head injury. The medical timeout was enacted this year to keep players safer. The new rule just needs to be used. Danny Ammendola returned after a one-week absence. By video, his injury was a mild PCL sprain that would limit his stopping and cutting. His usual jerk routes would be hard on his knee and the Patriots appeared to remove those from his playbook and modify his routes. He had some success with seven catches for 62 yards and one touchdown. Happily, Rob Gronkowski’s season is not over. In an unusual joint statement between team and family, Gronk has a bone bruise and a knee sprain. A bruise where he was hit will resolve quickly. A subchondral bone bruise near the joint from the leg whiplash would have him out longer. Julian Edelman was spotted walking without boot in public. This is no surprise. It indicates that he is on track for a 6-8 week return. The question is how effective will he be cutting in the first few weeks back. It is hard enough to win without healthy receivers. It is near impossible when giving up two special teams touchdowns and a 100-yard pick-six. Dallas has purposely not placed their QB on injured reserve, which leaves open the possibility for a return. Amazingly, if the Cowboys can win Monday night, they would only be one game out of first in the division. Romo reportedly has a hairline re-fracture that does not need surgery. Medically, this will heal in time for playoffs if the Cowboys can find a way to sneak in. Of course, the risk of another fall doing damage will not go away for six months as healing to 100% takes that long. Back-up Matt Hasselback was knocked around and handed his first loss this season. Bring on the Andrew Luck return talk. Initial team estimates of 2-6 weeks for Luck’s lacerated kidney were never realistic. Now Luck is expected to be back by Week 16, which would be seven weeks from injury. This is a realistic and safe estimate for the Colts QB to return. Chris Johnson has been placed on IR/designated for return for a fractured tibia. To my knowledge, this is the latest a team has ever used the short-term designation. He is required to sit eight weeks, meaning his only comeback would be if the Cardinals make the Super Bowl. Andre Ellington did not practice at all with his turf toe and missed Sunday’s game. The first metatarsal phalangeal joint is vital for a running back to run, cut and push off. I still expect an extended absence that will be at least the next game and likely beyond. To the victors go the spoils? Is that why the Giants QB had to wait for Brandon Marshall of the Jets to get X-rays? Not true at all. There is only one X-ray machine at each stadium. Sometimes a player has to wait as the machine is in use. When more than one player needs films the X-ray machine is prioritized as follows: 1) First come first served is the main mantra. 2) Injury severity/medical urgency can trump that. 3) Courtesy is given to the visitors who need to catch a flight home (which in this case doesn’t apply with two New York teams). This is rarely a big deal since X-rays don’t take longer than a few minutes. MMMD 6: Fewest injuries all year. We were due for a good injury week and I will happily take it. I don’t think this season is statistically worse than most but there seem to be more high profile injuries this year. C.J. Anderson exited with an ankle injury late in the first half. It was on a swing pass in hurry-up offense. The Broncos RB quickly limped off the field and there was no injury timeout. No replays were shown. By the one view, there was no distinct high or low sprain but more of a direct blow. We will need to rely on Monday information and this week’s practice reports to determine status. Stephon Gilmore said his shoulder popped out. A dislocation typically means a labral tear that needs surgery. There is precedent to return in a week or two with a brace to finish the season and then have surgery. Notably, Earl Thomas and Dont’a Hightower played thru the Super Bowl last year before surgery and returning in time for Week 1 2015. Dontrelle Inman was placed on a spine board and carted off. Fortunately, hospitals tests were all positive so far and “everything is looking good”. Overall it was a good news week with few injuries. I am always happy when a positive prediction comes true. In game, I did indicate that Matt Hasselback, Matt Schaub and Aqib Talib were not seriously injured and would stay in the game. Gronk’s injury is indeed not season-ending. Danny Ammendola did have to modify his routes with his mild PCL sprain. My initial 6-8 week Andrew Luck return estimate seems to be coming true. This takes last week’s 108-7 record to 114-7 for a 94.2% correct assessment record for 2015 to date.